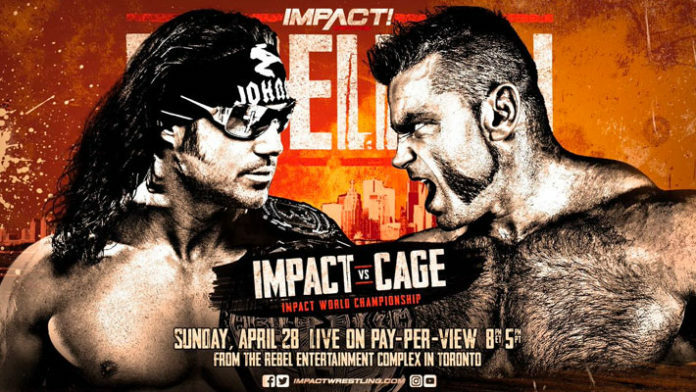 Johnny Impact will once again have to defend his title against Brian Cage on PPV. Impact Wrestling will present Rebellion from Toronto’s Rebel Nightclub on April 28th. The venue is where the promotion hosted Slammiversary last year. Last night on Impact Wrestling, the promotion confirmed that Johnny Impact will once again look to defend his World Championship against Brian Cage. They will meet one-on-one at Rebellion. A second title match between was scheduled for last week on Impact but never materialized. Killer Kross came out with a seemingly lifeless Johnny Impact draped over his shoulder before the match could begin. This was all a swerve to get Cage to reach, however, and when he did, Impact took him out of action with a cinder block. In the meantime, Cage will look to get his revenge on Killer Kross next week in single’s action. Provided they don’t face each between now and then, Rebellion will be the 6th time the two have faced each other in single’s action. 2018, Impact defeated Cage for the WSW Heavyweight title in Australia. Impact then improved his record to 4-1 against Cage by defeating him at Impact Wrestling Homecoming on 1/6 this year.